After I started tennis as an adult and began playing regularly, I quickly got excruciating shin splints. Just touching my shins would result in an immense amount of pain. I was overweight and my body was definitely not used to regular physical activity… especially on hard tennis courts. I was wearing nike lunar balistec shoes at the time and considered the possibility that my shoes might be causing the issue. I tried a different pair of shoes, Diadora’s and the pain continued. I was hoping for a quick fix and didn’t find it. Shin splints is inflammation of the muscles and tendons around the tibia in your leg. If you rub the “inner” side of your shin, you’ll most likely hit the most painful part of the shin splint because hat is where the inflamed muscles and tissues are connected to the bone. Icing regularly – I put a bag of ice directly on my shins for approx 10 minutes off and on for a total of 10 cycles. I did this every day. 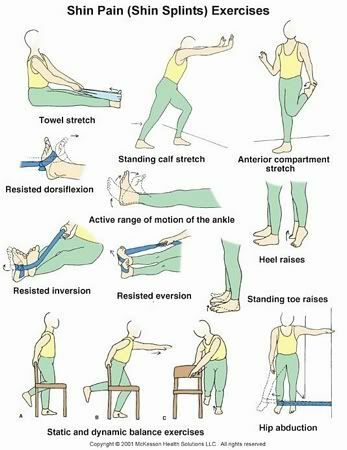 Stretching – I stretched my calf muscles and the muscles that connected to the tibia. I didn’t push anything too hard and if it hurt, I stopped. Rest – I remember taking about 10 days off for vacation and when I came back to play, the pain was around 33% of what it was before. As I continued back playing regularly, the pain went up a bit but along with icing and stretching, the pain slowly went away over the next 4 weeks or so. After doing the necessary treatments and fully recovering from shin splints, I’ve been lucky enough to never battle them again. I’ve been playing multiple times per week regularly for the last 4 years since my first shin splint bout. 1. Losing weight. Not having around 30 extra pounds putting pressure on my bones and joints has to be a big reason why I’ve never had shin splints since the first time. My body has probably acclimated to the regular playing but the extra pressure of the weight has certainly played a positive role in avoiding shin splints. 2. Mobility exercises and recovery. I have implemented a significant amount of stretching and foam rolling since I started playing. When I first came back, I never did any stretching or mobility exercises. I guess I thought I still had my teenage body and would recover without effort. Going out week after week with tight muscles almost assuredly lead to the inflamed muscles and tendons on my shins.